Legends and mythology are a big part of Chinese culture, especially in relation to the Chinese Zodiac. The depiction on a circular chart of 12 different animals representing the 12-year cycle of the Chinese lunar calendar was built on the foundation of astronomy and Chinese astrology which has existed for over 5,000 years.The Chinese Lunar Calendar is based on the cycles of the moon, and is constructed in a different fashion than the Western solar calendar. In the Chinese calendar, the beginning of the year falls somewhere between late January and early February. The Chinese have adopted the Western calendar since 1911, but the lunar calendar is still used for festive occasions such as the Spring Festival (Chinese New Year).Along with birth year animals, the Chinese Zodiac also represents inner animals and secret animals. Based on our year of birth, we understand that we're born under the sign of the Dog, or the Ox, or one of the 10 other signs. But the truth is it's the inner animals and the secret animals that actually tell most about who we really are and what our futures hold. According to Chinese legend, the twelve animals quarreled one day as to who was to head the cycle of years. The gods were asked to decide and they held a competition: whoever was to reach the opposite bank of the river would be first, and the rest of the animals would receive their years according to their finish.All the twelve animals gathered at the river bank and jumped in. Unknown to the ox, the rat had jumped into its ear. As the ox was about to jump ashore, the rat jumped out of the ox's ear, and won the race. The pig, who was very lazy, ended up last. That is why the rat is the first year of the animal cycle, the ox second and the pig last. 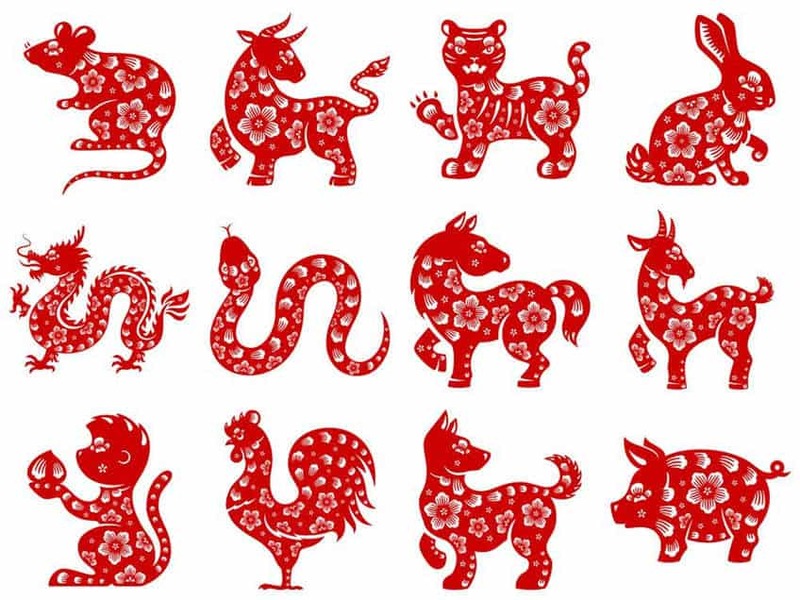 These 12 animals listed below represent the rotating 12-year cycle forming the basis of the Chinese Zodiac. And we also list the characteristics of those born in the year of the listed animals. Those born under the Chinese Zodiac sign of the Rat are quick-witted, clever, charming, sharp and funny. They have excellent taste, are a nice friend and are generous and loyal to others considered part of its pack. They, motivated by money, can be greedy, are very curious, seek knowledge and welcome challenges. es. Persons born in the Year of the Ox are diligent, patient and rather silent. They are reliable as friends. But they are easy to irritate and tend to be stubborn and obstinate, and may feel lonely and insecure. Those born under the Chinese Zodiac sign of the Tiger are sensitive, emotional and thoughtful but may also intend to be impatient. Others pay them respect but they sometimes get into conflicts of authority with elder people. They also have the guts to take risks and are very success- oriented. They have strong leadership qualities, and are ready to pounce any time. Those born under the Chinese Zodiac sign of the Rabbit enjoy being surrounded by family and friends. They're popular, compassionate, sincere, and they like to avoid conflict and are sometimes seen as pushovers. Rabbits enjoy home and entertaining at home. A powerful sign, those born under the Chinese Zodiac sign of the Dragon are energetic and warm-hearted, charismatic, egotistic and lucky at love. They're natural born leaders, good at giving orders and doing what's necessary to remain on top. People born in the Year of the Snake are seductive, gregarious, introverted, generous, charming, analytical, insecure, jealous, slightly dangerous, smart, and good with money. They rely on gut feelings, are hard-working and intelligent. Those born under the Chinese Zodiac sign of the Horse love to roam free. They're energetic, self-reliant, money-wise, and they enjoy traveling, love and intimacy. They're great at seducing, sharp-witted, impatient and sometimes seen as a drifter. Persons born under the Chinese Zodiac sign of the Goat enjoy being alone in their thoughts. They're creative, thinkers, wanderers, unorganized, high-strung and insecure, and can be anxiety-ridden. They need lots of love, support and reassurance. Appearance is important too. Those born in the year of the Monkey thrive on having fun. They're energetic, upbeat, and good at listening but lack self-control. They like being active and stimulated and enjoy pleasing self before pleasing others. They're heart-breakers, not good at long-term relationships, morals are weak. People born under the Chinese Zodiac sign of the Rooster are practical, resourceful, observant, analytical, straightforward, trusting, honest, perfectionists, neat and conservative. Dogs are loyal, faithful, honest, distrustful, often guilty of telling white lies, temperamental, prone to mood swings, dogmatic, and sensitive. They excel in business but have trouble finding mates. Those born under the Chinese Zodiac sign of the Pig are extremely nice, good-mannered and tasteful. They're perfectionists who enjoy finer things but are not perceived as snobs. They enjoy helping others and are good companions until someone close crosses them, then look out! They're intelligent, always seeking more knowledge, and exclusive.